Last Sunday, Nagato Sensei insisted on the idea of nuku 抜, in this case drawing out the body in the middle of the technique. When uke reacts in tension expecting contact you use this tension against him by removing, withdrawing, your body from the expected contact. The kûkan created confuses uke’s balance (body and mind) and he falls by himself. This concept of nuku is familiar to all of us when training biken jutsu. 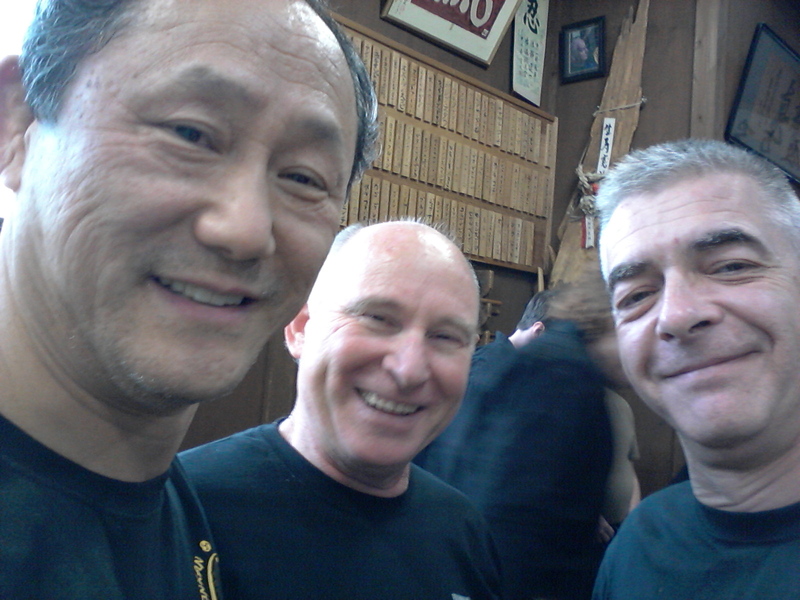 In the bujinkan getting the blade off the scabbard is called nuki gatana, 抜き. The nuku action is done not by pulling the sword off the scabbard but by “peeling off” the scabbard from the blade. This nuki action proves to be faster and more accurate in a real fight. I understand that it was the correct way to draw the sword during the Muromachi period. My guess is that this was done to have the time to free the whole blade of the tachi. Also sword fights were mainly about stunning the opponent, taking his balance and stabbing the unprotected part of the body through the holes in the yoroi. When the Tokugawa period began and peace established they abandoned the yoroi so the swords became smaller and the unsheathing of the sword was replaced by the iai action as cutting was now possible. There is a good way not to forget this difference with other sword system: I have been told that in Japan they use “nuki” when peeling the skin of a banana. Obviously when you eat a banana you do not pull the fruit off the skin but peel the skin to eat the fruit. The nuku action explained by Nagato sensei is possible only if uke is attacking correctly. By attacking correctly, he meant that the body of the attacker should be behind his attacks. He didn’t mean that we have to use violence but simply to be true in our intentions even if training with no speed. He added that many times he watches bujinkan members not attacking properly and that it is wrong. Because without a real intention these high level techniques cannot be revealed. To add to that I encourage you to train more and to master the tsuki (and the uke nagashi). These are fundamental techniques of basic taijutsu and they are not trained enough in many dôjô. Train your kihon happô at each class and when you have the chance to be uke, train on your attacks. After a while you will notice a real improvement in your taijutsu as a whole. I remember once someone asking sensei about tsuki and kicks and telling him that they were not really taught in the bujinkan. Sensei answered dryly: “and why do you think we train the kihon happô for?”. A good and long study of the kihon happô will benefit to your whole taijutsu and this is why sensei asked us to train them at each training session. This is something he told us long time ago but I believe it is still true today. If you do not train the kihon happô and/or the sanshin no kata in your dôjô at every class then please print this and give it to your teacher. Call it is a direct transmission of the Sôke from last century. With good basics in your taijutsu you are capable of attacking in a true manner and those beautiful nuku moments can be yours.